For today's youth, code clubs and learning through programming is reality. How can programming and teaching be combined and what is the future of all this. What were your favorite classes at elementary school? Programming lessons, maybe? You often stayed at afternoon code clubs after the normal school day? Did you secretly learn English during different programming activities and games? For today's adults this was not the case. However, for today's youth it is. 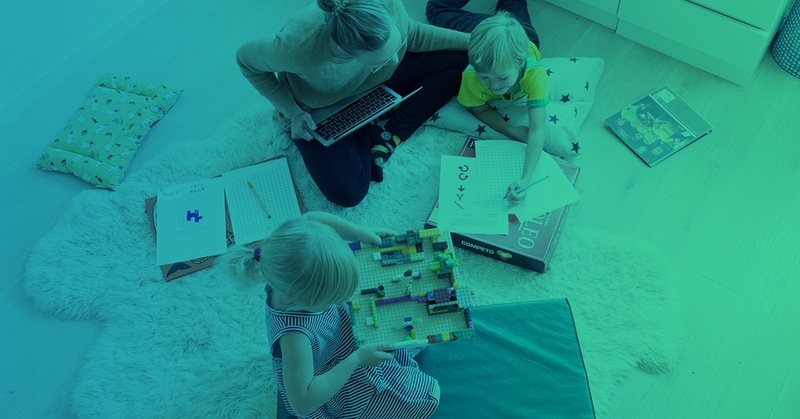 "Programming has already become part of Finnish elementary school syllabus even though it is not a separate school subject", Eficode's Senior Software Engineer Emilia Mattila states at the beginning of the conversation. Emilia is not a typical programmer, she is also studying full-time to be a kindergarten teacher. She is currently studying childhood education at the University of Helsinki. What is the story behind this, and how have these two occupations fitted together in her career? Also, why are code schools so important for today and in the future? Let's find out! "I started at Eficode in 2011. I was starting my career in the field of Software and I was pondering between different companies where to work. Then I found Eficode from Great Place to Work® study and it soon stood out from other employer candidates. Now it is easy to say that it was the right choice. At Eficode I have been able to work shorter six-hour days and leave freedom to express myself while saving time for my hobbies and family. I have flexibility to arrange my work schedule and vacations that are best suited for me. This is a huge benefit for an employee with family and small children. "I have actively sought different possibilities within work. I have always been interested in learning, inside and outside work. I am also idealistic and want to see more girls involved in shaping the future through science and coding. How could I contribute to this? Finally, I found my way as I realised I could expand my knowledge into teaching and theory." Emilia tells about her professional journey. Emilia always thought that working life should not feel like being trapped and vice versa. Subsequently, Eficode gave her the courage to do things she is passionate about. In today’s digitalized world, coding is a fundamental skill like reading or mathematics. Due to changes in the national curriculum, children have now the opportunity to learn programming at schools as well. Code clubs are excellent addition for the ones who want to learn more. That sparked Emilia to start leading coding clubs for children. Eficode is a great place to work for a person who has family with small children. "A year ago I visited the Millenium X as a code club leader and instructor where the children and their parents were involved together. Teaching coding started to interest me more and more, and I found my way to lead code club activities at Luma, University of Helsinki. In addition to that, last summer I was tutoring two one-week summer science camps in Helsinki. Both of these camps were fully booked and it is clear that the demand is high for these kinds of activities for children. Learning programming is truly important in the children's learning process." "All of these experiences with code schools have only strengthened my passion for teaching and children education. I am intrigued by the possibilities of the combinations of programming and teaching. Basically, the reward of these two different areas are the same - teaching the children is very persistent work, like programming. I am also interested how I am able to develop myself to be a better professional in both of these occupational areas. Group dynamics and team work are an essential ground in the learning experience for kids. I have noticed that these same aspects should be the base in software development, as well. Combining ideas from different individuals will produce the best end results." Emilia opens up how IT knowledge and teaching can be combined, even given each other new assets. Learning programming is truly important is in the children's learning process. So, how the future of code clubs in Finland looks like? At the moment, according to Finnish curriculum, information technology is not an individual school subject, but it is well integrated to all subjects. Some elementary schools have their own digital tutors but for now, almost every school would need outside help and consulting to get the coding permanently on board. Emilia thinks that coding as it's own subject might be impossible right now, but there should be more information about the devices and what you can do with them, besides than just playing video games. She believes that coding should be part of common knowledge and therefore schools need to take part in teaching it. Those kids who get excited about the possibilities obtained through coding, it will turn into a hobby and something they pursue out of their own interest. "It is important for children to learn mathematical and observational thinking in elementary education. For small children, it is vital to learn things through playfulness, arts and crafts. I would bring programming and coding to kids already in kindergarten, through playfull activities and by learning problem solving skills. For example, I have been in two-hour code club, where every child created a labyrinth from Legos and code instructions for completing the labyrinth. To test the solution they would be shared to another group that would follow the instructions and to spot what could be fixed or further improved. Finally, together they would make the needed imrovements." "In this kind of excercise, the problem solving, causal connection and logical rationalization are constantly developed. It is important for the kids to see their progress and how others solve similar issues to develop their thinking. This is why, code clubs use games to make visible the process of coding and all its necessary stages ie. planning, implementation, testing, debugging and co-work. In addition, kids are learning to know themselves and getting a great feeling and reward after possible problems and long hard thinking. Within an hour, kids can go from total 'I cannot do this' feeling to exchilerated feelings of success once they have solved something they didn't know they could do. After the game, feelings are often filled with joy and eagerness to try out more. Then, it's is rewarding for me as well." Emilia states programming is as facinating as learning. Obstacles for code clubs expanding more is the lack of resources such as space, computers and teachers. Emilia ponders whether companies could support code clubs by providing free office space and material resources for the code club organizers. Hopefully this will happen soon or later!